The Canadian Armed Forces (CAF; French: Forces armées canadiennes, FAC), or Canadian Forces (CF) (French: Forces canadiennes, FC), are the unified armed forces of Canada, as constituted by the National Defence Act, which states: "The Canadian Forces are the armed forces of Her Majesty raised by Canada and consist of one Service called the Canadian Armed Forces." This unified institution consists of sea, land, and air elements referred to as the Royal Canadian Navy (RCN), Canadian Army, and Royal Canadian Air Force (RCAF). Personnel may belong to either the Regular Force or the Reserve Force, which has four sub-components: the Primary Reserve, Supplementary Reserve, Cadet Organizations Administration and Training Service, and the Canadian Rangers. Under the National Defence Act, the Canadian Armed Forces are an entity separate and distinct from the Department of National Defence (the federal government department responsible for administration and formation of defence policy), which also exists as the civilian support system for the Forces. Current end strength is authorized at 126,500, including 71,500 Regular Force members, 30,000 Reserve Force members and 25,000 civilian employees. The number of filled positions is lower than the authorized strength. The Commander-in-Chief of the Canadian Armed Forces is the reigning Canadian monarch, Queen Elizabeth II, who is represented by the Governor General of Canada. The Canadian Armed Forces is led by the Chief of the Defence Staff, who is advised and assisted by the Armed Forces Council. Contributing to broader international security. During the Cold War, a principal focus of Canadian defence policy was contributing to the security of Europe in the face of the Soviet military threat. Toward that end, Canadian ground and air forces were based in Europe from the early 1950s until the early 1990s. However, since the end of the Cold War, as the North Atlantic Treaty Organization (NATO) has moved much of its defence focus "out of area", the Canadian military has also become more deeply engaged in international security operations in various other parts of the world – most notably in Afghanistan from 2002 to 2014. Consistent with the missions and priorities outlined above, the Canadian Armed Forces also contribute to the conduct of Canadian defence diplomacy through a range of activities, including the deployment of Canadian Defence Attachés, participation in bilateral and multilateral military forums (e.g. the System of Cooperation Among the American Air Forces), ship and aircraft visits, military training and cooperation, and other such outreach and relationship-building efforts. The Federal Government now factors in military related spending from departments such as Veterans Affairs, Public Works, and the Treasury Board when calculating "defence spending". It is believed that this move was made in order to improve Canada's defence related NATO reporting metrics. Prior to Confederation in 1867, residents of the colonies in what is now Canada served as regular members of French and British forces and in local militia groups. The latter aided in the defence of their respective territories against attacks by other European powers, Aboriginal peoples, and later American forces during the American Revolutionary War and War of 1812, as well as in the Fenian raids, Red River Rebellion, and North-West Rebellion. Consequently, the lineages of some Canadian army units stretch back to the early 19th century, when militia units were formed to assist in the defence of British North America against invasion by the United States. The responsibility for military command remained with the British Crown-in-Council, with a commander-in-chief for North America stationed at Halifax until the final withdrawal of British Army and Royal Navy units from that city in 1906. Thereafter, the Royal Canadian Navy was formed, and, with the advent of military aviation, the Royal Canadian Air Force. These forces were organised under the Department of Militia and Defence, and split into the Permanent and Non-Permanent Active Militias—frequently shortened to simply The Militia. By 1923, the department was merged into the Department of National Defence. The first significant overseas deployment of Canadian military forces occurred during the Second Boer War, when several units were raised to serve under British command. Similarly, when the United Kingdom entered into conflict with Germany in the First World War, Canadian troops were called to participate in European theatres. 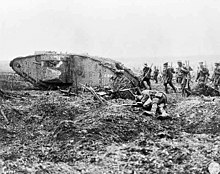 Battles which are particularly notable to the Canadian military include the Second Battle of Ypres, the Battle of the Somme, the Battle of Vimy Ridge, the Second Battle of Passchendaele, as well as a series of attacks undertaken by the Canadian Corps during the Hundred Days Offensive. During this period, a distinctly Canadian army and navy was established, followed by an air force, that, because of the constitutional arrangements at the time, remained effectively under the control of the British government until Canada gained legislative independence from the United Kingdom in 1931, in part due to the distinguished achievement and sacrifice of the Canadian Corps in the First World War. In November 1940, the Canadian militia is formally renamed the Canadian Army. However, in the 1950s, Reserve Army forces were once again referred to as "Militia" in official documentation, and although rare, is still used to refer to part-time members. Canadian Forces entered the Second World War in September 1939, after the Canadian Crown-in-Council declared war on Nazi Germany. Battles and campaigns during the Second World War that were particularly notable to the Canadian military include the Battle of the Atlantic, the Battle of Britain, the Battle of Hong Kong, the Dieppe Raid, the invasion of Sicily and Italy, Operation Overlord, the Siegfried Line Campaign, Operation Veritable, as well as the strategic bombing of German cities. 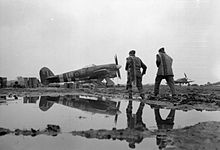 At the end of the Second World War, Canada possessed the fourth-largest air force and fifth-largest naval surface fleet in the world, as well as the largest volunteer army ever fielded. Conscription for overseas service was introduced only near the end of the war, and only 2,400 conscripts actually made it into battle. Originally, Canada was thought to have had the third-largest navy in the world, but with the fall of the Soviet Union, new data based on Japanese and Soviet sources found that to be incorrect. Since 1947, Canadian military units have participated in more than 200 operations worldwide, and completed 72 international operations. Canadian soldiers, sailors, and aviators came to be considered world-class professionals through conspicuous service during these conflicts and the country's integral participation in NATO during the Korean War, First Gulf War, Kosovo War, and in United Nations Peacekeeping operations, such as the Suez Crisis, Golan Heights, Cyprus, Croatia, Bosnia, Afghanistan, and Libya. Canada maintained an aircraft carrier from 1957 to 1970 during the Cold War, which never saw combat but participated in patrols during the Cuban Missile Crisis. 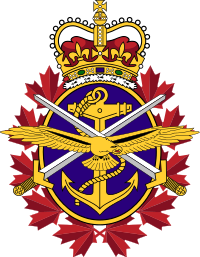 The current iteration of the Canadian Armed Forces dates from 1 February 1968, when the Royal Canadian Navy, Canadian Army, and Royal Canadian Air Force were merged into a unified structure and superseded by elemental commands, known as Air Command, Land Force, and Maritime Command. On 16 August 2011, the names for the three elemental commands were reverted to their historical predecessor, although the unified structure of the Canadian Armed Forces was maintained. After the 1980s, the use of the "Canadian Armed Forces" name gave way to "Canadian Forces". The "Canadian Armed Forces" name returned in 2013. Deployment of Land Forces during this period has included Canadian emergencies, NATO efforts in Europe, peacekeeping operations within United Nations-sanctioned conflicts and combat missions. The Forces were deployed in Afghanistan until 2011, under the NATO-led United Nations International Security Assistance Force (ISAF), at the request of the Government of Afghanistan. The Forces are today funded by approximately CA$20.1 billion annually and are presently ranked 74th in size compared to the world's other armed forces by number of total personnel, and 50th in terms of active personnel, standing at a strength of roughly 68,000, plus 27,000 reservists, bringing the total force to approximately 95,000. These individuals serve on numerous Canadian Forces bases located in all regions of the country, and are governed by the Queen's Regulations and Orders and the National Defence Act. In 2008, the Government of Canada began efforts, through the "Canada First Defence Strategy", to modernize the Forces, through the purchase of new equipment, improved training and readiness, as well as the establishment of the Canadian Special Operations Regiment. More funds were also put towards recruitment, which had been dwindling throughout the 1980s and '90s, possibly because the Canadian populace had come to perceive the Forces as peacekeepers rather than as soldiers, as shown in a 2008 survey conducted for the Department of National Defence. The poll found that nearly two thirds of Canadians agreed with the country's participation in the invasion of Afghanistan, and that the military should be stronger, but also that the purpose of the forces should be different, such as more focused on responding to natural disasters. Then CDS, Walter Natynczyk, said later that year that while recruiting has become more successful, the Forces was facing a problem with its rate of loss of existing members, which increased between 2006 and 2008 from 6% to 9.2% annually. 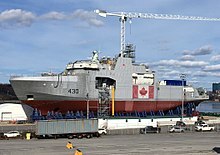 Construction of a Harry DeWolf-class offshore patrol vessel at Halifax Shipyard in 2018. The ship emerged from the Arctic Patrol Ship project. In the 1950s, the recruitment of women was open to roles in medicine, communication, logistics, and administration. The roles of women in the CAF began to expand in 1971, after the Department reviewed the recommendations of the Royal Commission on the Status of Women, at which time it lifted the ceiling of 1,500 women personnel, and gradually expanded employment opportunities into the non-traditional areas—vehicle drivers and mechanics, aircraft mechanics, air-traffic controllers, military police, and firefighters. Lt. Col. Pelletier briefs Vermont Army National Guard soldiers on the integration of women in the Canadian Armed Forces. The Department further reviewed personnel policies in 1978 and 1985, after Parliament passed the Canadian Human Rights Act and the Canadian Charter of Rights and Freedoms. As a result of these reviews, the Department changed its policies to permit women to serve at sea in replenishment ships and in a diving tender, with the army service battalions, in military police platoons and field ambulance units, and in most air squadrons. In 1987, occupations and units with the primary role of preparing for direct involvement in combat on the ground or at sea were still closed to women: infantry, armoured corps, field artillery, air defence artillery, signals, field engineers, and naval operations. On 5 February 1987, the Minister of National Defence created an office to study the impact of employing men and women in combat units. These trials were called Combat-Related Employment of Women. All military occupations were open to women in 1989, with the exception of submarine service, which opened in 2000. Throughout the 1990s, the introduction of women into the combat arms increased the potential recruiting pool by about 100 per cent. Women were fully integrated in all occupations and roles by the government of Jean Chrétien, and by 8 March 2000, even allowed to serve on submarines. All equipment must be suitable for a mixed-gender force. Combat helmets, rucksacks, combat boots, and flak jackets are designed to ensure women have the same level of protection and comfort as their male colleagues. The women's uniform is similar in design to the men's uniform, but conforms to the female figure, and is functional and practical. Women are also provided with an annual financial entitlement for the purchase of brassiere undergarments. The Canadian constitution determines that the Commander-in-Chief of the Canadian Armed Forces is the country's sovereign, who, since 1904, has authorized his or her viceroy, the governor general, to exercise the duties ascribed to the post of Commander-in-Chief and to hold the associated title since 1905. All troop deployment and disposition orders, including declarations of war, fall within the royal prerogative and are issued as Orders in Council, which must be signed by either the monarch or governor general. Under the Westminster system's parliamentary customs and practices, however, the monarch and viceroy must generally follow the advice of his or her ministers in Cabinet, including the prime minister and minister of national defence, who are accountable to the elected House of Commons. The Armed Forces Council is the senior military body of the Canadian Forces. The Council typically operates from Pearkes building in Ottawa. The Armed Forces' 92,600 personnel are divided into a hierarchy of numerous ranks of officers and non-commissioned members. The governor general appoints, on the advice of the prime minister, the Chief of the Defence Staff (CDS) as the highest ranking commissioned officer in the Armed Forces and who, as head of the Armed Forces Council, is in command of the Canadian Forces. The Armed Forces Council also includes the Vice Chief of the Defence Staff, the commanders of the Royal Canadian Navy, the Canadian Army, the Royal Canadian Air Force, Canadian Joint Operations Command, Canadian Special Operations Forces Command, and other key Level 1 organizations. The Armed Forces Council generally operates from National Defence Headquarters (NDHQ) in Ottawa, Ontario. The sovereign and most other members of the Canadian Royal Family also act as colonels-in-chief, honorary air commodores, air commodores-in-chief, admirals, and captains-general of Canadian Forces units, though these positions are ceremonial. Canada's Armed forces operate out of 27 Canadian Forces bases (CFB) across the country, including NDHQ. This number has been gradually reduced since the 1970s with bases either being closed or merged. Both officers and non-commissioned members receive their basic training at the Canadian Forces Leadership and Recruit School in Saint-Jean-sur-Richelieu. Officers will generally either directly enter the Canadian Armed Forces with a degree from a civilian university or receive their commission upon graduation from the Royal Military College of Canada. Specific element and trade training is conducted at a variety of institutions throughout Canada, and to a lesser extent, the world. HMCS Calgary of the Royal Canadian Navy departs Pearl Harbor for the at-sea phase of RIMPAC 2014. The Royal Canadian Navy (RCN), headed by the Commander of the Royal Canadian Navy, includes 28 warships and submarines deployed in two fleets: Maritime Forces Pacific (MARPAC) at CFB Esquimalt on the west coast, and Maritime Forces Atlantic (MARLANT) at Her Majesty's Canadian Dockyard in Halifax on the east coast, as well as one formation: the Naval Reserve Headquarters (NAVRESHQ) at Quebec City, Quebec. The fleet is augmented by various aircraft and supply vessels. The RCN participates in NATO exercises and operations, and ships are deployed all over the world in support of multinational deployments. Soldiers from Princess Patricia's Canadian Light Infantry conducting an exercise during RIMPAC 2012. The Canadian Army is headed by the Commander of the Canadian Army and administered through four divisions—the 2nd Canadian Division, the 3rd Canadian Division, the 4th Canadian Division and the 5th Canadian Division—the Canadian Army Doctrine and Training System and the Canadian Army Headquarters. Currently, the Regular Force component of the Army consists of three field-ready brigade groups: 1 Canadian Mechanized Brigade Group, at CFB Edmonton and CFB Shilo; 2 Canadian Mechanized Brigade Group, at CFB Petawawa and CFB Gagetown; and 5 Canadian Mechanized Brigade Group, at CFB Valcartier and Quebec City. Each contains one regiment each of artillery, armour, and combat engineers, three battalions of infantry (all scaled in the British fashion), one battalion for logistics, a squadron for headquarters/signals, and several smaller support organizations. A tactical helicopter squadron and a field ambulance are co-located with each brigade, but do not form part of the brigade's command structure. The 2nd, 3rd and 4th Canadian Divisions each has a Regular Force brigade group, and each division except the 1st has two to three Reserve Force brigades groups. In total, there are ten Reserve Force brigade groups. The 5th Canadian Division and the 2nd Canadian Division each have two Reserve Force brigade groups, while the 4th Canadian Division and the 3rd Canadian Division each have three Reserve Force brigade groups. Major training and support establishments exist at CFB Gagetown, CFB Montreal and CFB Wainwright. A Royal Canadian Air Force CF-18 Hornet over Iraq in support of Operation Impact. The Royal Canadian Air Force (RCAF) is headed by the Commander of the Royal Canadian Air Force. The commander of 1 Canadian Air Division and Canadian NORAD Region, based in Winnipeg, is responsible for the operational command and control of Air Force activities throughout Canada and worldwide. 1 Canadian Air Division operations are carried out through eleven wings located across Canada. The commander of 2 Canadian Air Division is responsible for training and support functions. 2 Canadian Air Division operations are carried out at two wings. Wings represent the grouping of various squadrons, both operational and support, under a single tactical commander reporting to the operational commander and vary in size from several hundred personnel to several thousand. Major air bases are located in British Columbia, Alberta, Saskatchewan, Manitoba, Ontario, Quebec, Nova Scotia, and Newfoundland and Labrador, while administrative and command and control facilities are located in Winnipeg and North Bay. A Canadian component of the NATO Airborne Early Warning Force is also based at NATO Air Base Geilenkirchen near Geilenkirchen, Germany. The RCAF and Joint Task Force (North) (JTFN) also maintain at various points throughout Canada's northern region a chain of forward operating locations, each capable of supporting fighter operations. Elements of CF-18 squadrons periodically deploy to these airports for short training exercises or Arctic sovereignty patrols. The Canadian Joint Operations Command is an operational element established in October 2012 with the merger of Canada Command, the Canadian Expeditionary Force Command and the Canadian Operational Support Command. The new command, created as a response to the cost-cutting measures in the 2012 federal budget, combines the resources, roles and responsibilities of the three former commands under a single headquarters. Members of the Canadian Special Operations Regiment during a freefall jump out of a USAF C-17 Globemaster III. The regiment is one of five units that make up CANSOFCOM. The Canadian Special Operations Forces Command (CANSOFCOM) is a formation capable of operating independently but primarily focused on generating special operations forces (SOF) elements to support CJOC. The command includes Joint Task Force 2 (JTF2), the Canadian Joint Incident Response Unit (CJIRU) based at CFB Trenton, as well as the Canadian Special Operations Regiment (CSOR) and 427 Special Operations Aviation Squadron (SOAS) based at CFB Petawawa. Among other things, the Information Management Group is responsible for the conduct of electronic warfare and the protection of the Armed Forces' communications and computer networks. Within the group, this operational role is fulfilled by the Canadian Forces Information Operations Group, headquartered at CFS Leitrim in Ottawa, which operates the following units: the Canadian Forces Information Operations Group Headquarters (CFIOGHQ), the Canadian Forces Electronic Warfare Centre (CFEWC), the Canadian Forces Network Operations Centre (CFNOC), the Canadian Forces Signals Intelligence Operations Centre (CFSOC), the Canadian Forces Station (CFS) Leitrim, and the 764 Communications Squadron. In June 2011 the Canadian Armed Forces Chief of Force Development announced the establishment of a new organization, the Directorate of Cybernetics, headed by a Brigadier General, the Director General Cyber (DG Cyber). Within that directorate the newly established CAF Cyber Task Force, has been tasked to design and build cyber warfare capabilities for the Canadian Armed Forces. The Health Services Group is a joint formation that includes over 120 general or specialized units and detachments providing health services to the Canadian Armed Forces. With few exceptions, all elements are under command of the Surgeon General for domestic support and force generation, or temporarily assigned under command of a deployed Joint Task Force through Canadian Joint Operations Command. A Canadian Rangers training camp in Alert, Nunavut. The Canadian Rangers are a sub-component of the Canadian Armed Forces reserve force. after 2002 there is no sub division of the Supplementary Reserve. Members of The Cameron Highlanders of Ottawa, a infantry regiment of the Primary Reserve, marches through Ottawa, Ontario. Approximately 26,000 citizen soldiers, sailors, and airmen, trained to the level of and interchangeable with their Regular Force counterparts, and posted to CAF operations or duties on a casual or ongoing basis, make up the Primary Reserve. This group is represented, though not commanded, at NDHQ by the Chief of Reserves and Employer Support, who is usually a major general or rear admiral, and is divided into four components that are each operationally and administratively responsible to its corresponding environmental command in the Regular Force – the Naval Reserve (NAVRES), Land Force Reserve (LFR), and Air Reserve (AIRRES) – in addition to one force that does not fall under an environmental command, the Health Services Reserve under the Canadian Forces Health Services Group. The Cadet Organizations Administration and Training Service (COATS) consists of officers and non-commissioned members who conduct training, safety, supervision and administration of nearly 60,000 cadets aged 12 to 18 years in the Canadian Cadet Organization. The majority of members in COATS are officers of the Cadet Instructors Cadre (CIC) branch of the CAF. Members of the Reserve Force Sub-Component COATS who are not employed part-time (Class A) or full-time (Class B) may be held on the "Cadet Instructor Supplementary Staff List" (CISS List) in anticipation of employment in the same manner as other reservists are held as members of the Supplementary Reserve. Operational dress uniforms for the three branches of the Canadian Armed Forces. Whereas field uniforms place rank on the chest, naval and air uniforms display rank on the shoulder. Although the Canadian Armed Forces are a single service, there are three similar but distinctive environmental uniforms (DEUs): navy blue (which is actually black) for the navy, rifle green for the army, and light blue for the air force. CAF members in operational occupations generally wear the DEU to which their occupation "belongs." CAF members in non-operational occupations (the "purple" trades) are allocated a uniform according to the "distribution" of their branch within the CAF, association of the branch with one of the former services, and the individual's initial preference. Therefore, on any given day, in any given CAF unit, all three coloured uniforms may be seen. Occupational dress, which is specialized uniform articles for particular occupations (e.g., medical / dental). Only service dress is suitable for CAF members to wear on any occasion, barring "dirty work" or combat. With gloves, swords, and medals (No. 1 or 1A), it is suitable for ceremonial occasions and "dressed down" (No. 3 or lower), it is suitable for daily wear. Generally, after the elimination of base dress (although still defined for the Air Force uniform), operational dress is now the daily uniform worn by most members of the CF, unless service dress is prescribed (such as at the NDHQ, on parades, at public events, etc.). Approved parkas are authorized for winter wear in cold climates and a light casual jacket is also authorized for cooler days. The Royal 22nd Regiment parading in full dress for the 400th anniversary of Quebec City. The Canadian Army's universal full dress includes a scarlet tunic, and midnight blue trousers. Units of the Canadian Army, Royal Canadian Air Force, and cadets of the Royal Military College of Canada also wear full dress uniforms. The Army's universal full dress uniforms includes a scarlet tunic, midnight blue trousers with a scarlet trouser stripe. 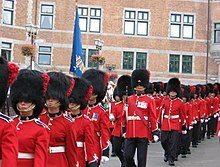 However, many regiments in the Canadian Army maintain authorized regimental differences from the Army's universal full dress, most notably for its armoured units, Scottish regiments, and Voltigeur/Rifle regiments. The full dress uniform for cadets Royal Military College is similar to the Army's universal full dress uniform. Full dress uniforms for units of the Royal Canadian Air Force include a blue tunic, and blue trousers and facings. Naval full dress includes a navy blue tunic and trousers with white facings, although the Canadian Forces dress instructions state that naval full dress is no longer worn. Authorized headdress for the Canadian Armed Forces are the: beret, wedge cap, ballcap, Yukon cap, and tuque (toque). Each is coloured according to the distinctive uniform worn: navy (white or navy blue), army (rifle green or "regimental" colour), air force (light blue). Adherents of the Sikh faith may wear uniform turbans (dastar) (or patka, when operational) and Muslim women may wear uniform tucked hijabs under their authorized headdress. Jews may wear yarmulke under their authorized headdress and when bareheaded. The beret is probably the most widely worn headgear and is worn with almost all orders of dress (with the exception of the more formal orders of Navy and Air Force dress), and the colour of which is determined by the wearer's environment, branch, or mission. Naval personnel, however, seldom wear berets, preferring either service cap or authorized ballcaps (shipboard operational dress), which only the Navy wear. Air Force personnel, particularly officers, prefer the wedge cap to any other form of headdress. There is no naval variant of the wedge cap. The Yukon cap and tuque are worn only with winter dress, although clearance and combat divers may wear tuques year-round as a watch cap. Soldiers in Highland, Scottish, and Irish regiments generally wear alternative headdress, including the glengarry, balmoral, tam o'shanter, and caubeen instead of the beret. The officer cadets of both Royal Military Colleges wear gold-braided "pillbox" (cavalry) caps with their ceremonial dress and have a unique fur "Astrakhan" for winter wear. The Canadian Army wears the CG634 helmet. ^ Persons 16 years of age, with parental permission, can join the Canadian Armed Forces. ^ "Gen. Jonathan Vance becomes chief of defence staff, vows to tackle harassment". Canadian Broadcasting Corporation. Retrieved 17 June 2015. ^ Department of National Defence. "National Defence and the Canadian Armed Forces > Chief of the Defence Staff". Queen's Printer for Canada. Archived from the original on 21 February 2009. Retrieved 16 October 2008. ^ a b c Defence, Government of Canada, National. "Frequently Asked Questions | National Defence | Canadian Armed Forces, Question #12". www.forces.gc.ca. Retrieved 2018-12-22. ^ CAF Operations. "There are approximately 1700 @CanadianForces members deployed on 20 operations worldwide". twitter.com. Retrieved 21 January 2018. ^ "The World Factbook > Canada > Military". Central Intelligence Agency. 19 November 2015. Retrieved 23 November 2015. ^ a b "Defence Expenditure of NATO Countries (2010-2017)" (PDF). NATO. Retrieved 30 March 2018. ^ a b c d "Strong, Secure, Engaged" (PDF). dgpaapp.forces.gc.ca. Minister of National Defence. ^ "Spending and human resources". National Defence and the Canadian Forces. Retrieved 30 March 2018. ^ a b Elizabeth II (1985). National Defence Act. II.14. Ottawa: Queen's Printer for Canada. Archived from the original on 30 November 2009. Retrieved 20 January 2009. ^ "Frequently Asked Questions — What is the relationship between DND and the CAF?". Department of National Defence. 2013-07-27. Retrieved 2014-04-11. ^ "About the Canadian Armed Forces". Her Majesty the Queen in Right of Canada. 27 July 2013. Archived from the original on 17 March 2015. Retrieved 3 April 2015. ^ "About the Department of National Defence and the Canadian Armed Forces – National Defence Act". Her Majesty the Queen in Right of Canada. 23 May 2013. Retrieved 3 April 2015. ^ a b Victoria (29 March 1867). Constitution Act, 1867. III.15. Westminster: Queen's Printer. Retrieved 15 January 2009. ^ Lagassé, Philippe (December 2013). "The Crown's Powers of Command-in Chief: Interpreting Section 15 of Canada's Constitution Act, 1867" (PDF). Review of Constitutional Studies. 18 (2): 189–220. ^ a b "Governor General of Canada > Commander-in-Chief". Rideau Hall. Archived from the original on 1 December 2007. Retrieved 15 January 2009. ^ "About Us – National Defence – Canadian Forces". Archived from the original on 11 October 2014. Retrieved 9 October 2014. ^ "Canadian military involvement in Afghanistan formally ends". 12 March 2014. Retrieved 21 August 2017. ^ Department of National Defence (30 March 2009). "Canada First Defence Strategy". Archived from the original on 1 April 2009. Retrieved 15 February 2015. ^ "Canadian Defence Attaché Network". Outcan.forces.gc.ca. 22 July 2010. Archived from the original on 6 July 2011. Retrieved 23 March 2011. ^ "Planned Expenditures". forces.gc.ca. Department of National Defence. Retrieved 24 March 2016. ^ Scotti, Monique. "Even with new military investments, Canada to fall short of NATO target". Global News. ^ Nersessian, Mary (9 April 2007). "Vimy battle marks birth of Canadian nationalism". CTV. Archived from the original on 15 February 2009. Retrieved 20 January 2009. ^ Cook, Tim (2008). Shock troops: Canadians fighting the Great War, 1917–1918. Toronto: Viking. ISBN 0-670-06735-0. ^ Gilmour, Sarah (17 May 2006). "Navy celebrates 96 years" (PDF). The Maple Leaf. 9: 10. Archived from the original (PDF) on 6 February 2009. ^ "Canadian armed forces to be 'royal' once again". BBC News. 16 August 2011. Retrieved 2016-01-20. ^ "National Defence Act". Government of Canada. Retrieved 25 August 2016. ^ "Current Operations". Archived from the original on 28 July 2014. Retrieved 2 August 2014. ^ The Canadian Press (5 September 2005). "Canadians still view troops as peacekeepers: DND poll". CTV. Archived from the original on 6 September 2008. Retrieved 5 September 2008. ^ The Canadian Press (21 November 2008). "Military as message for job seekers: we want you". CTV. Archived from the original on 1 August 2012. Retrieved 22 November 2008. ^ a b c d Defence, Government of Canada, National. "National Defence – Canadian Armed Forces – Backgrounder – Women in the Canadian Armed Forces". ^ "Army News (National) – Canadian Army – Article – Historical Features of the Canadian Army Restored". ^ "1st Canadian Division". Archived from the original on 12 March 2014. ^ Department of National Defence (15 February 2012). "National Defence and the Canadian Forces > CFOA 66-6 Precedence in the Canadian Forces". Queen's Printer for Canada. Archived from the original on 7 February 2012. Retrieved 15 February 2012. ^ Department of National Defence (19 December 2008). "National Defence and the Canadian Forces > About DND/CF". Queen's Printer for Canada. Retrieved 2 January 2009. ^ "Administrative Order: Implementation of Cadet Organizations Administration and Training Service", NDHQ 1085-30 (D Cdts 6) dated 2 July 2009. ^ Canada – National Defence: "A-AD-265-000/AG-001 CANADIAN FORCES DRESS INSTRUCTIONS Archived 23 March 2010 at the Wayback Machine"
^ a b c "6-1". Canadian Armed Forces Dress Instruction (PDF). Canadian Armed Forces. 1 June 2001. p. 211. Retrieved 11 June 2018. Leuprecht, Christian & Sokolsky, Joel. (2014). Defense Policy "Walmart Style" Canadian Lessons in "not so grand" Grand Strategy. Armed Forces & Society Journal Online First. Wikimedia Commons has media related to Canadian Armed Forces and Military of Canada. This page was last edited on 12 April 2019, at 10:10 (UTC).